Grips listed here are compatible with all Skinny Sweeps and Ultralight Sweeps manufactured from August 1, 2018, to present. All Other Sweeps There are 8 products. Replacement 5 cm adjustable grip made of azure blue rubber with longitudinal ribs. 36 mm diameter. Sold individually. For use on the following oars that feature the Length Adjustment System: Ultralight sweeps built after August 1, 2018, all Skinny sweeps, and all Sculls. 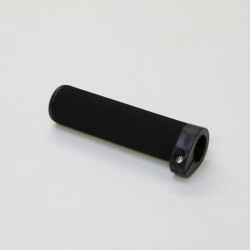 Replacement 5 cm adjustable grip made of smooth, black rubber. 35 mm diameter. Sold individually. For use on the following oars that feature the Length Adjustment System: Ultralight sweeps built after August 1, 2018, all Skinny sweeps, and all Sculls. Replacement 5 cm adjustable grip made of ice blue rubber with longitudinal ribs. 33.5 mm diameter. Sold individually. For use on the following oars that feature the Length Adjustment System: Ultralight sweeps built after August 1, 2018, all Skinny sweeps, and all Sculls. Replacement 5 cm adjustable grip made of cellular foam. 35 mm diameter. Sold individually. For use on the following oars that feature the Length Adjustment System: Ultralight sweeps built after August 1, 2018, all Skinny sweeps, and all Sculls. Replacement 5cm adjustable grip made of smooth green rubber. Sold individually. For use on the following oars that feature the Length Adjustment System: Ultralight sweeps built after August 1, 2018, all Skinny sweeps, and all Sculls. Replacement 5 cm adjustable outside grip made of microfiber suede. 37 mm diameter. For use on the following oars that feature the Length Adjustment System: Skinny sweeps and *Ultralight sweeps built after August 1, 2018. Replacement 5 cm adjustable grip made of contoured orange rubber. Radial finger sized contours and brushed texture. Firm, durable material. Sold individually. For use on the following oars that feature the Length Adjustment System: Ultralight sweeps built after August 1, 2018, all Skinny sweeps, and all Sculls. 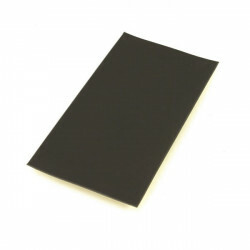 A 4.95" by 9", self-adhesive microfiber suede patch for replacing the suede on an inside sweep grip. Sold individually. Purchase one for each inside grip you need to replace.